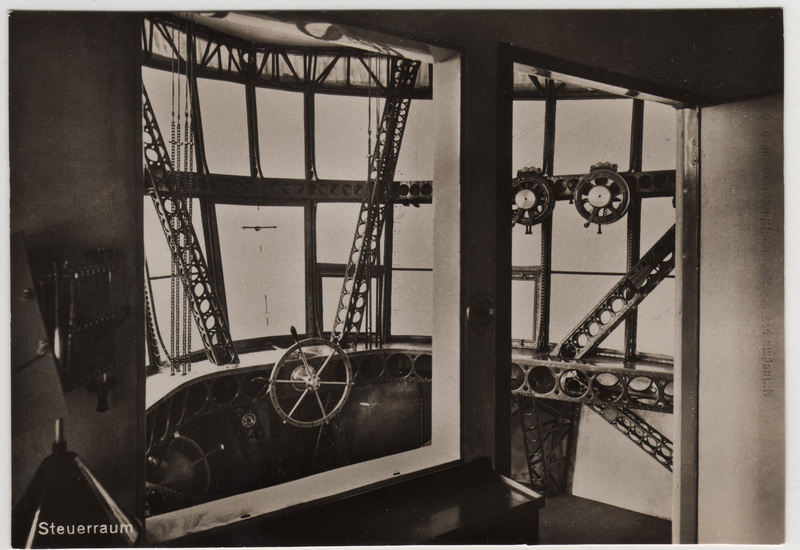 The control room and passenger areas on the Graf Zeppelin were both located within the airship’s 98′ long gondola. 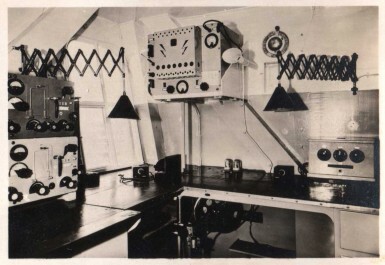 As seen in the deckplan included in this 1934 brochure, the ship’s control room was located at the very bow of the gondola, just ahead of the chart room, radio room, and kitchen. 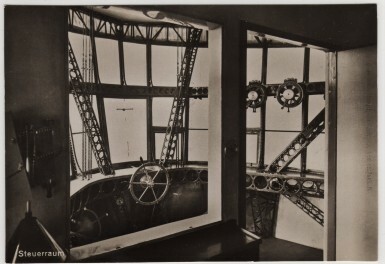 The control room contained rudder and elevator control wheels, gas and water ballast release controls, engine telegraphs, and flight and navigation instruments. 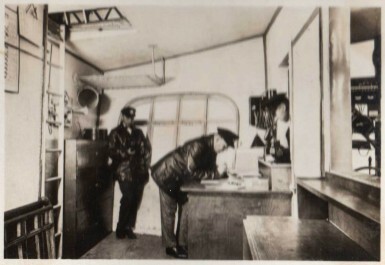 Across from the radio room was a small kitchen containing electric burners and ovens, an electric water heater, a refrigeration unit, and compact storage and preparation areas. 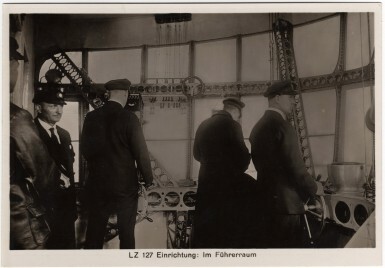 Obviously, no open flames were allowed on the hydrogen-filled airship. 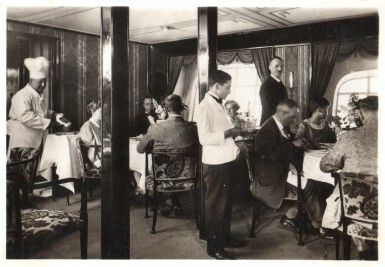 Aft of the kitchen was a combination lounge/dining room, approximately 16′ square, which was the only public passenger space aboard the ship. 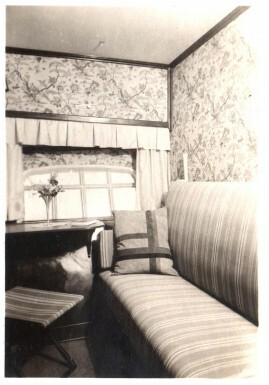 But while the surroundings were luxurious, they were also unheated, and during the winter months, or when the ship flew over the North Atlantic, or during the flight over Siberia as part of the 1929 Round-the-World flight, passengers often spent much of their time wrapped in heavy winter coats or covered by layers of blankets while ice crystals formed on the windows. We have a million cubic feet of gas but no heat. . . . Merciless cold driving through the canvas walls of this flying tent. … I have visualized myself gracefully draped over a saloon window ledge romantically viewing the moonlit sky. The men . 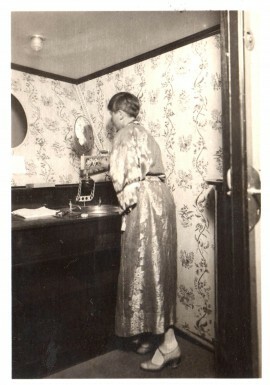 . . have reminded each other not to forget evening jackets and boiled shirts in their baggage. 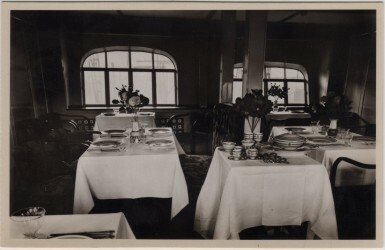 We have drawn ourselves lovely pictures of dining elegantly in mid-air with Commodore Eckener at the head of a flower-decked table . . . but . . . leather coats, woollies and furs will be our evening dress. Hot soup and steaming stew more welcome than cold caviar and chicken salad. 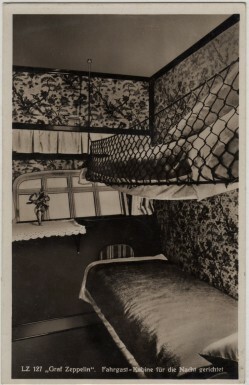 Accommodation for the ship’s twenty passengers was provided in ten small cabins, containing upper and lower berths similar to those aboard a railroad sleeping car, and which could be arranged for daytime or nighttime use. 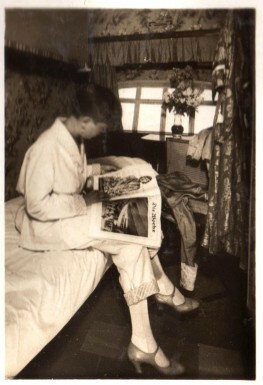 Like the rest of the ship, the cabins were unheated. 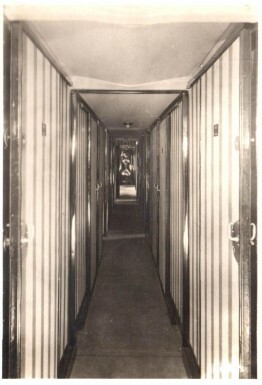 The cabins were located on a narrow corridor, at the end of which were separate washrooms for men and women. I had no idea at the extent of this airship. Thanks for informing us so throughly. 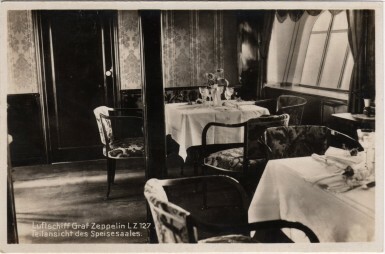 Estoy trabajando en un libro sobre la única llegada del Graf Zeppelin a Buenos Aires. Ello fue el 30 de junio de 1934. Agradezco todos los comentarios, que me ayudan a conocer un poco más sobre la vida a bordo. I love this site, Dan! I’ve come back time and again conducting research for my novels. I was wondering if there was access to the keel from the gondola in the Graf Zeppelin and where would the access be. From the bridge area, perhaps? It does! Missed that in the photo. Thanks! Would love to travel on one of these-but the negative aspect of this would be of course terrorism-what a huge and slow moving target! 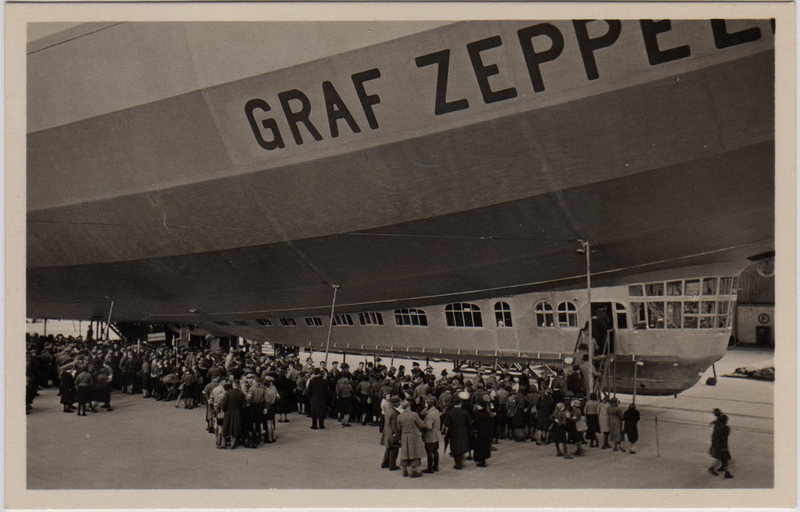 The Graf Zeppelin never had helium in it. The problem of a vacuum ship as I understand it is to do with materials strength against buckling. Not even diamond is strong enough! Just shut up Kyle. You sound like nothing but a pretentious, moronic Redneck, with more stupidity than intellect. People like you are the reason everybody gets p*ssed off with Americans. Idiot. Well that was uncalled for. Maybe it would help if you understood what he was writing about before posting a personal attack on someone. Such posts speak much more about you rather than about the subject of your attack. Boeing did outsource it’s jobs from Seattle – to South Carolina, a right to work state.